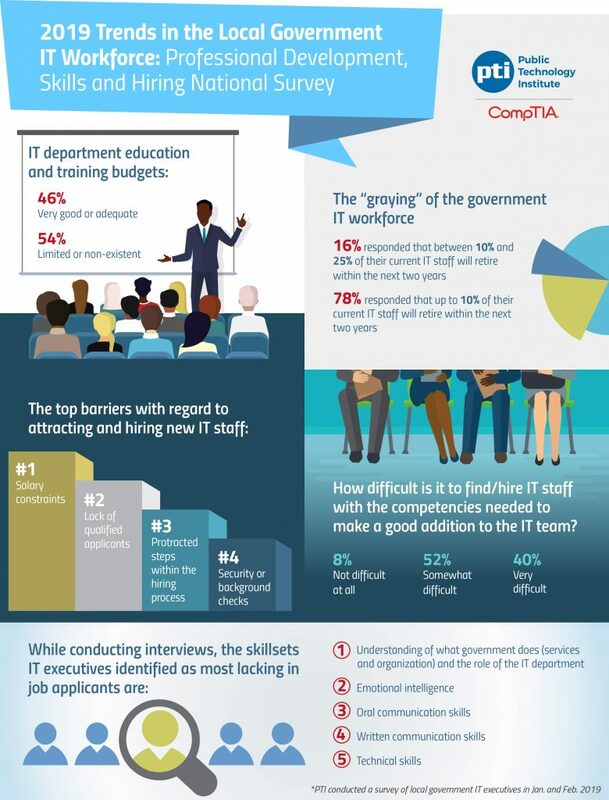 Local governments are struggling with finding qualified candidates to fill information technology roles, according to a recent infographic from the Public Technology Institute. The government IT workforce is also getting older, presenting yet another challenge for local technology executives. Sixteen percent of respondents said that between 10 and 25 percent of their current IT staff will retire within the next two years, while 78 percent reported that up to 10 percent of their staffs are expected to soon retire. The survey reached 120 local government information technology executives nationwide. This infographic was provided to StateScoop for publication as a part of a media partnership with the Public Technology Institute. For more information on this poll and other PTI activities, check out pti.org.